The Washington Nationals have all but given up on the 2018 season. The club has failed to gain any traction in the NL East this year, beginning Tuesday 7.5 games out of first place and one game under .500. As a result, the Nats have started a fire sale. On Tuesday, they traded Daniel Murphy to the Chicago Cubs and Matt Adams to the St. Louis Cardinals. Those two moves signal that Washington is throwing in the towel in 2018. The Nationals considered selling players before the non-waiver trade deadline on July 31. They decided against it, hoping to take one last shot at making a playoff push. However, amidst a series of injuries, the club has continued to struggle. They have finally decided to part ways with players like Murphy and Adams who will be free agents at season’s end. Of course, Washington’s loss means a big gain for a pair of teams in the NL Central. 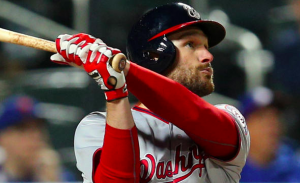 Both Murphy and Adams were claimed off waivers initially, allowing the Nationals to work out a trade with both the Cubs and Cardinals. For Murphy, Washington received infield prospect Andruw Monasterio and a player to be named later. For Adams, the Nationals merely received cash from St. Louis. In Murphy, the Cubs get a versatile infielder who has come on strong with the bat lately. Murphy, as Cubs fan might remember, was the offensive catalyst for the Mets when they swept the Cubs in the 2015 NLCS. Now Chicago has Murphy to help them lock up the NL Central and make a deep postseason run. Since the all-star break, Murphy is hitting .340 with an OPS of .904. After missing the early part of the season following offseason knee surgery, Murphy has found his groove and is once again looking like an impact offensive player. He could help the Cubs at third base for the injured Kris Bryant. Murphy could also play second base, allowing Javier Baez to play shortstop in place of Addison Russell, who has struggled offensive the second half of the season. Meanwhile, the Cardinals have reacquired Adams, who spent his entire career in St. Louis until being traded to the Braves last May. Adams is currently hitting .257 with an OPS of .842. He’s provided plenty of power this season while playing both first base and left field. Adams will help to make the St. Louis lineup and bench much deeper. The Cardinals have surged recently, putting them within striking distance of the Cubs in the NL Central. Adding a bat like Adams can help them to stay hot. In addition to teams claiming both Murphy and Adams, the Dodgers reportedly claimed Bryce Harper. However, Los Angeles and Washington were not able to agree to a trade for him. That means Harper will stay with the Nationals for the rest of the season. However, that doesn’t mean the Nationals are done trading away pieces. There are a few more players on Washington’s roster who could impact pennant races, much like Murphy and Adams could end up doing for their new teams.